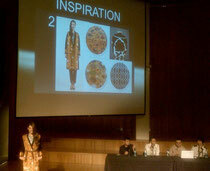 On April 18th, FIT hosted "Preserving Asian Culture through Fashion and Textiles." One of the truly beautiful collections featured was Kraton, by the Indonesian designer Auguste Soesatro. He is using some of the fabrics from Cita Tenun Indonesia - a group seeking to provide resources and training to weavers in various parts of Indonesia - in the hope that the the weavers can increase their productivity and reach a broader market. The clothing and the textiles are stunning. Hopefully in the near future you will see the collection here.